The late music icon and national hero Oliver “Tuku” Mtukudzi might have left a big void in the music industry, but through her daughters, Selmor and Sandra, Tuku’s fans might have something to smile at if their performance at the Selmor Mtukudzi and Friends — Tuku Music Lives On concert on Friday night at Andy Miller Hall at Harare Showgrounds was anything to go about. The Mtukudzi sisters, backed by some of their late father’s Black Spirits band members Piki Kasamba and Never Mpofu silenced critics with a par excellence performance that resembled nothing short of a well-rehearsed and choreographed set. Taking to the stage soon after midnight, dressed in a white chemise with some African prints on front and a matching pair of trousers, Selmor was leading the band, well-complimented by sister Sandra who apart from matching her sister’s colours reminded many of Tuku’s dressing as she donned a black hat and an unfastened African print shirt. If the fans’ reactions to their performance on the night that could have been enjoyed even by the late Tuku are anything to go by, then epic would be the best way to describe how the sisters were a marvel to watch throughout their set alongside Selmor’s husband Tendai Manatsa as they left fans clamouring for more. Flawless vocals that were on point, dance routines and stage gestures during their performances, Selmor really revived Tuku’s memories as they warmed the hearts of the late star’s fans and many followers of showbiz matters. And in a sign of embracing and appreciating Selmor’s performance, the captivated audience could not help, but sing and dance along, making the event very memorable. Among the Tuku renditions that was part of Selmor’s playlist included Perekedza Mwana, Ziwerere, Hear Me Lord and Madiro on which she was joined by award winning multi-instrumentalist and music producer who also once played for Tuku, Clive Mono Mukundu, veteran singer Steve “Dongi” Makoni to perform Handiende, Rovangoma Mutavara, Munendipasa Manyemwe, Kubvongodza Muto and Chiri Nani. 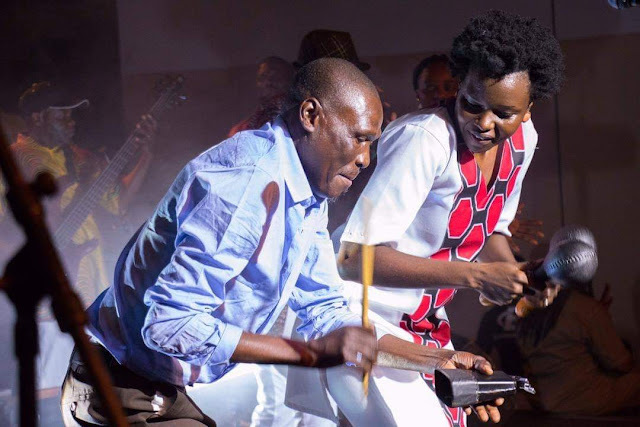 “Let me call Bamunini mufana wa mudhara vakangofanana fanana nawo so [let me call my father’s look-alike young brother] Piki Kasamba,” said Selmor as Kasamba joined her on the stage for the song Perekedza Mwana much to the delight of the fans.